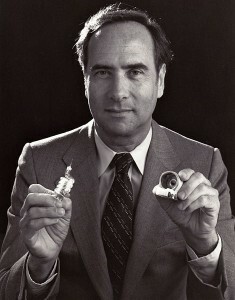 Physicist Theodore Maiman creates the first laser light, using a synthetic-ruby crystal device. He was not the first to develop the theories behind lasers nor first to apply for patents, but he was the first to create an operating laser device. The light produced by this device was not a true beam as we think of most lasers today, but rather a pulse. Other researchers would create the first laser beam soon after.